Sometimes car travel can be full of adventures and fun, while other times it is just unavoidable or stressful. You may decide to, or need to, bring your furry family members along so we’re here to equip you with the knowledge to do so successfully. Below you’ll find tips for keeping pets safe, secure, and happy through the miles. Before you set out on your journey, carefully plan out where you’ll be staying in the evenings (or when you’re not driving). Even if you can be spontaneous and sleep in a variety of climates with minimal issues, the same isn’t necessarily true for our pets. The heat and humidity of the spring and summer seasons, when you prefer to travel by car, are particularly problematic for dogs and cats. The chill of the night during any season could also be an issue for your four-legged friend, especially if they’re of the short or no hair variety. So, find pet-friendly hotels with fully-functioning AC and/or heating. If you’ll be staying in cabins or camping it’s even more imperative that you pack appropriate accessories or even attire for your pets. Bring a sweater for the cold, a light shirt for protection from the sun during extended exposure, and shoes or boots if rough terrain or other inclimate weather are in your future. 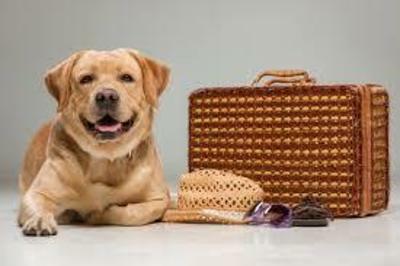 Don’t forget that bringing a carrier on your trip will make getting in and out of your lodging considerably easier, especially if you have a smaller pet that you’re able to carry. Remember not to just push your pet into a brand-new carrier when you’re headed out the door! This can cause a lot of stress for your pet and make it more problematic in the future when you need to put them back in or they could have an accident in it while you’re on the road. Instead, give them at least one week to adjust to the carrier prior to your trip by putting it in your home and even putting some of their toys in it. Make any carrier or crate a safe and comfortable space with soft blankets, items with your scent such as old t-shirts or pillowcases, and even catnip for cats. Remember that crates and carriers should never be used for punishment and if you’ve used them in that way you’ll want to begin fixing that association your pet has as soon as possible. Whether your pet eats dry, wet, raw, or a combination of those foods, be sure to stock up before your trip and bring a little extra, too, just in case. As a bonus, look up pet stores that will be nearby that will be accessible to you and make sure that they carry your pet’s food. You’ll want to store it safely on your trip so you’ll need to consider temperature and packaging above all. If you split up cans between multiple meals or feed a raw diet, you’ll need to get a cooler. If you’ll be staying in hotels you can get ice from the ice machine or you can buy small bags of ice at gas stations when you refuel. If your pet’s food comes in easily-punctured packaging, such as a dry food bag, consider getting a hard, airtight container for it. Don’t leave large amounts of food with your pet unattended either, in case they gorge themselves. Offer your pet water frequently while you’re on the road. Ask your veterinarian how frequently you should offer water to your pet but, if for some reason you don’t get a chance, assume it should be offered at least once every hour. Consider bringing a filled water bottle with you in case you go a long stretch without refueling or find the water questionable in an unfamiliar area. If you have never traveled to this particular destination, or surrounding areas, be sure to find out if the tap water is safe to drink so you can be sure you and your pet won’t get sick during your travels. Make frequent bathroom breaks for canine companions and secure a litter box with completely fresh litter in your vehicle for feline friends. Keep supplies for waste, such as poop bags, readily available and in a couple of different places such as the center console, glove box, and a tote or handbag so you don’t find yourself without one when you need it. Finally, while travel induces tummy upset for many of us regardless of how many legs we walk on, pay attention to your pet’s waste and note any dramatic increases or decreases in amount, changes in consistency or color, and more. After all, waste can tell you a lot about someone’s health. You’re not completely ready to embark just with roadside assistance and some extra food as your only backups! You’ll want to bring a pet first-aid kit on your trip as well. Remember: you cannot anticipate everything and anything that can or will happen, but you can be as prepared as possible. If you’re going to an isolated area, or traveling through one, consider learning basic emergency procedures as well. Knowing what to do in scenarios involving toxic exposure or common injuries will benefit you whether traveling or at home. Finally, after all of the preparations have been made and you set out on this journey, enjoy the quality you have with your pet. You have an exciting road up ahead so set those tires spinning and have fun!